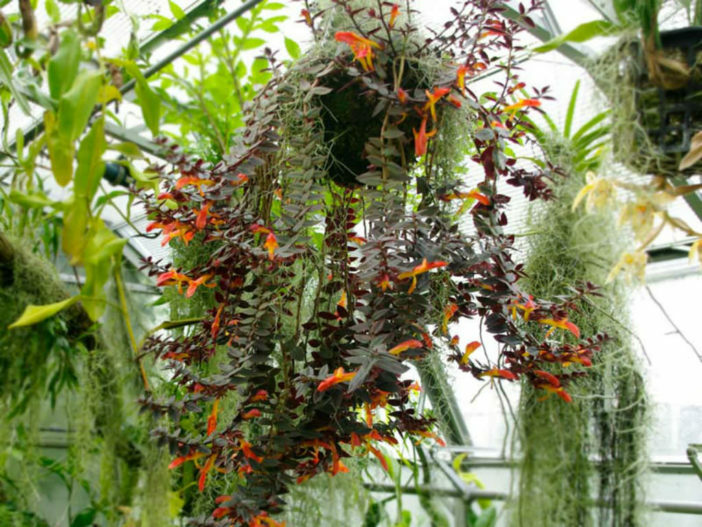 Columnea gloriosa is also called Goldfish Plant for the appearance of its flowers. It is ideal for a hanging basket in a greenhouse or sunroom. It has long slender pendulous branches with opposite pairs of slightly hairy green leaves. Bright scarlet, tubular flowers with yellow throats appear at every leaf joint. Long stems can reach up to 3 feet (90 cm). This plant is a perennial and can live 30 years with good care. It is native to Central and South America and the Caribbean. Goldfish Plant likes lots of light but not direct sun, which can burn the leaves. Setting it in an eastern or northern facing window works well. It will also do well under artificial lights. In the summer, water freely and keep the soil moist. During the winter, let the soil dry out more between waterings. However, never let it dry out completely. This regime seems to encourage better blooms. Columnea plants like plenty of humidity. If the plant is in a regular pot, you can place a saucer full of pebbles under the pot and put water in it. As the water evaporates, it creates a high humidity spot for the plant. Do not let the water touch the Goldfish Plant’s pot, however. If it is in a hanging basket, mist the leaves daily to keep them happy. Use room temperature water as cold water will cause brown spots on the leaves. Fertilize weekly during the growing season with a water soluble fertilizer with lots of Phosphorus to encourage blooming. Do not fertilize during the winter. Use a good, well draining potting soil when potting these plants. Columnea plants seem to do better when slightly root bound and produce better flowers in this condition. Every two to three years, repot the plant in a pot one size up from the one it is in. Gently trim the roots to encourage new root growth. Place the plant in fresh potting soil when repotting for maximum success. Make sure the pot you choose has drainage holes to prevent root rot in the plant from poor drainage. Pinch off the stem tips often to encourage branching. It is a good idea to keep the stems 12 to 18 inches (30 to 45 cm) long so that the plant does not look leggy. Columnea plants are sensitive to high temperatures. If you see browning of the leaves or leaf drop, the plant is probably too hot and needs to be moved to a cooler location. Columnea plants are propagated from stem cuttings. Pick a stem tip that does not have a flower on it and cut it off leaving 2 to 3 inches (5 to 7.5 cm) of stem. Dip in rooting hormone and plant in a good potting soil mix. Leave in the light until new growth begins. Cuttings will not bloom the first year they are propagated because they are putting all their energy toward growing new roots and vegetation. Goldfish Plants are vulnerable to aphids, spider mites, and mealy bugs. These can all be combated by spraying the plant with an insecticidal soap. Make sure you get all surfaces of the leaves and plant wet with the soap to completely eliminate the problems.